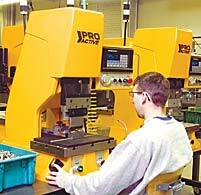 ProEnterpriz can help by providing a machine with or without basic tooling. to produce the tooling and fixturing for a turnkey project. The ProActive "Smart Press" is used to inspect, correct, straighten, assemble, or form difficult to manufacture parts with micrometer accuracy. Lasers, proximity switches, or linear scales feed data back to the machine to make corrective decisions for accuracy. Just 40" high, this versatile bench-top servo driven press produces 7500 pounds of controlled force. 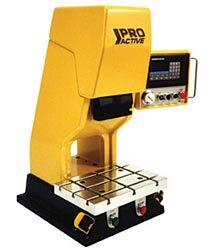 Constructed of durable cast aluminum components, the "Smart Press" weighs only 615 pounds allowing for easy handling and movement. An operator friendly control panel utilizes a key pad or electronic hand wheel for data entry during set-up. In a matter of minutes, an unfamiliar operator can be up and running. Click the thumbnails to view more detailed images.